A call to a URI like this will be delivered just like a normal incoming call. Except the caller won't incur any call charges. You do need to use the hostname aa.org.uk as we use SRV records to direct the call, so using an IP address is not supported. The CLI is not trusted for such calls, so are sent to your SIP handset with a ? on the front of the number (which may confuse some caller ID display units), and not passed on if the call is diverted. 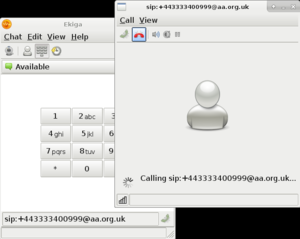 So, for example, without any configuration or account details a softphone may call your A&A provided VoIP number, as shown in the image here. As mentioned, this does require the client (the phone you're calling from) to support SRV records. This page was last modified on 10 April 2019, at 17:43.